SEBASTOPOL, CA--(Marketwired - May 28, 2014) - Maker Faire, the Greatest Show (and Tell) on Earth, held at the San Mateo Event Center over May 17 and 18, has received rave reviews from Faire visitors. By all accounts it was the biggest and best Maker Faire Bay Area to date with over 1,100 maker entries exhibiting their projects, hobbies, products, and innovations; over 200 presentations from the maker movement's experts, thought leaders, and motivators across 8 stages; and the widest variety of topics on tap illustrating the movement's breadth and depth. Attendees reveled in all that was offered to them to learn, see, do, and gain inspiration from at the Faire including learning how to use 3D printers to make useful items at home or for their business; seeing how fashion and technology are merging to create intelligent wearables; hearing Adam Savage's "10 Commandments of Making;" learning how to get started with Arduino, Galileo, and BeagleBone; and so much more. Over 130,000 attendees participated in the Faire representing 49 states and 42 countries around the world. "The gathering of makers and attendees at this year's event really cements the fact that the maker movement is truly creating a shift in how the world wants to learn and create," said Dale Dougherty, president of Maker Media and co-founder of Maker Faire. "People are experiencing a real change in how they view themselves and others as makers and catalysts of innovation, no matter the topic -- robotics, sustainability, 3D printing, homesteading, space; you name it and people across the globe are changing the way those things are developed, shared, and produced. Maker Faire is so proud to be the place where makers of all types, ages, and skill levels come to be inspired and take their making to new heights. And, as we kick off the Year of the Maker with one of our flagship events, we couldn't be more thrilled with the outcome of the Bay Area event." Faire fans will want to mark their calendars with the Maker Faire Bay Area 2015 dates -- Saturday, May 16, and Sunday, May 17, 2015. The 10th annual Maker Faire Bay Area will bring another maker-packed weekend complete with awesome attractions, exciting new projects and developments from the maker community, and more experts sharing their knowledge and creativity. Maker Faire celebrated 100 Faires in 2013 alone and has reached over 1.5 million attendees globally since it launched in San Mateo, California, in 2006, less than a year after the publication of the first MAKE Magazine in 2005. The ninth annual Maker Faire Bay Area welcomed some 1,100 makers entries and over 130,000 attendees. World Maker Faire New York, the other flagship event, has grown in four years to 600+ makers and 75,000 attendees. Detroit, Kansas City, Rome, Oslo, Newcastle (UK), Tokyo and Shenzhen host our "featured" Maker Faires (200+ makers), and community-driven, independently organized Mini Maker Faires inspire and ignite creative communities everywhere around the United States and internationally. Located in Sebastopol, California, Maker Media has been widely credited with jumpstarting the worldwide Maker Movement, which has been a transforming force in innovation, culture, and education. In addition to publishing MAKE Magazine and producing Maker Faire, Maker Media develops "getting started" kits and books it sells through its Maker Shed store as well as other retail channels. Maker Faire Bay Area 2014 Goldsmith and Silversmith sponsors include: Goldsmith: Intel, Oracle, RadioShack; Silversmith: Atmel, Autodesk, Cognizant, Ford, NASA, Roblox. 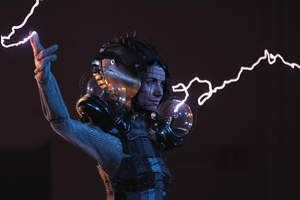 Anouk Wipprecht at Maker Faire Bay Area 2014 showcasing her Faraday wearable. Photo credit Kyle Cothern. Maker Faire Bay Area 2014: A Drone's Eye View. Credit 3D Robotics. Professional flight operation using 3D Robotics' IRIS autonomous aerial vehicle.